For the first time since last December, I am writing a game review following a meaningful Seahawks loss. The Seahawks fell to the San Diego Chargers 30-21 on Sunday, dropping to 1-1 on the season. The Seahawks are now tied with the San Francisco 49ers and the St. Louis Rams for 2nd place in the NFC West. The Chargers improve to 1-1 and currently have sole possession of 2nd place in the AFC West. This loss marks the first game since November 6th, 2011 that the Seahawks have lost by more than one score. As resilient as the Seattle offense appeared to be at moments, it was the defense that failed to step up to stop the powerful Chargers offense. This is what I took out of this week’s game. Offense Played Well Enough to Win: The Seahawks offense scored 21 points and in any other game that would probably be enough to hold on for the win. Throughout the entire game I held the confidence that if the defense struggled, the offense could go down the field and get us right back into the game. Quarterback Russell Wilson had a very solid game going 17/25 for 202 yards and a pair of touchdowns. Despite a lack of pocket awareness which Wilson showed at untimely moments, he did not turn the ball over which was great to see. The only Seahawks turnover came on special teams when Percy Harvin fumbled a kickoff in the second quarter. I was impressed with the way Robert Turbin stepped in for Marshawn Lynch, gaining 45 yards and scoring his first career touchdown at the end of the first half. As a team Seattle was able to pound out 108 rushing yards against a stout Chargers defense which is definitely an optimistic sign. Ultimately and unfortunately, our offense simply could not hang with a Chargers offense that proved that their performance last week in Arizona could be considered a fluke. 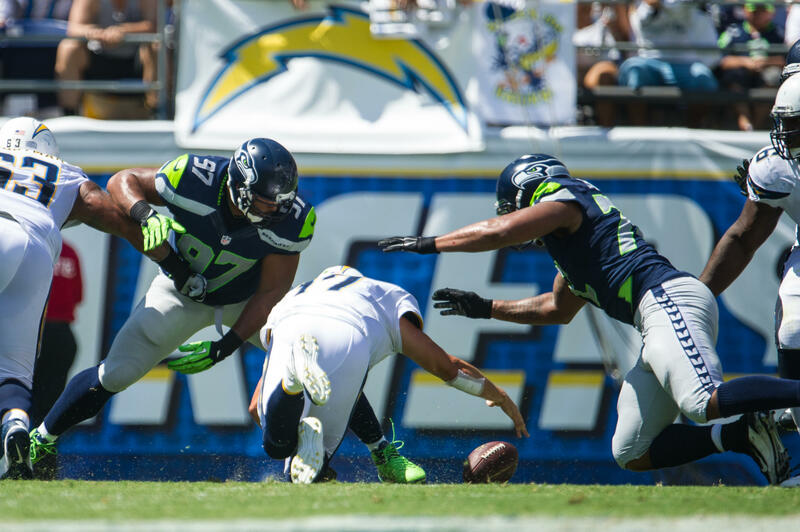 Offensive Line Showed its Weaknesses: Although San Diego only sacked Russell Wilson twice on Sunday the Seahawks quarterback was constantly under pressure. The right side of the offensive line was not able to withstand a barrage of San Diego pressure especially on passing downs later on in the game. J.R. Sweezy was called for a crucial holding penalty on a first-down conversion. 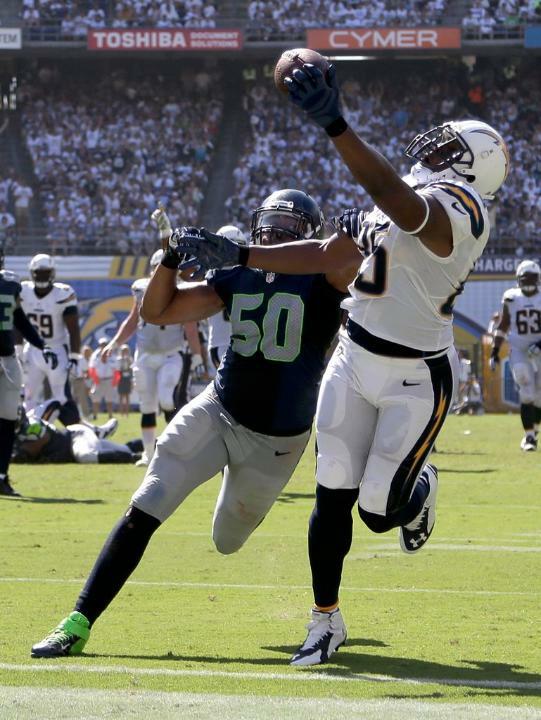 The penalty nullified the gain and the Seahawks eventually punted back to the Chargers. The left side of the San Diego defense, like I highlighted in my game preview, clearly found holes in the game of rookie right tackle Justin Britt and later in the game the majority of the Seahawks offensive plays went to the left side of the line to try to take some of the pressure off of Sweezy and Britt. Penalties a Problem: On Sunday the Seahawks were called for 8 penalties totaling 53 yards. I consider the number of penalties to be above average with the penalty yardage decent. The reason why I bring up this point is that in this game like some of our close losses in the recent past, our penalties seemed to come at the most inopportune of times. The majority of our offensive penalties occurred on first down conversions while defensive penalties came on 3rd down stops which would of halted San Diego drives. Instead, defensive penalties directly led to 14 of the Chargers 30 points. Gates Unstoppable and Rivers Picks Defense, Legion of Boom Apart: Seahawks cornerback Richard Sherman was thrown to 4 times on Sunday and in each instance Chargers quarterback Philip Rivers threw completions. Sherman however was never burned over the top for a big gain. All of the passes thrown in Sherman’s direction were zone coverage plays. On only one play do I distinctly remember Sherman turning the wrong way, leading to a completion from Rivers to Keenan Allen on a quick slant which resulted in a San Diego first down. The kryptonite for the Legion of Boom this week was tight end Antonio Gates who caught 7 catches for 96 yards and a career-tying 3 touchdown receptions. Other than Jimmy Graham of the New Orleans Saints, Gates may be the biggest matchup nightmare among tight ends in the NFL. His size advantage creates a problem even against the big, long, and physical style of the members of the Legion of Boom. Gates beat Kam Chancellor, Malcolm Smith, and K.J. Wright on his three touchdown catches. Upon watching the film of Gates’ performance, I do not understand why the Seahawks were using our outside linebackers to cover Gates, especially after his second touchdown when it was proven Gates could easily beat our linebackers down the middle of the field. All in all the Seahawks defense allowed 276 passing yards, a number that we must work to decrease in practice this upcoming week, especially with Peyton Manning up next for the L.O.B. Third Down Defense a Major Weakness: The Seahawks defense simply could not get off the field on third down this week. San Diego’s offense went 10/17 on third down on Sunday. The 59% third down efficiency of the Chargers is the worst percentage the Seahawks have surrendered in a loss since the Detroit Lions were 75% effective on third down in a 28-24 Seahawks loss in October 2012. 70% of San Diego’s third down conversions came through the air, with the majority coming in short to moderate yards to gain. At home next week I believe the Seahawks will recover and play a more sound game with the 12th Man behind their backs, but our inability to stop drives this week raises questions about our defense in a road environment, as the Seahawks have historically had trouble in this area on the road in seasons past. Irvin Potentially Cost Us the Game: You look at the score and see that the Seahawks lost by two possessions but I believe that one bonehead play by defensive end Brice Irvin potentially altered the outcome of this game. The play in question came with the Chargers driving deep into Seahawks territory towards the end of the third quarter. With San Diego leading 20-14 and facing a 3rd down and 7, Seattle was successful in forcing Philip Rivers out of the pocket. Rivers scrambled to the right sideline short of the line to gain. As it was clear that Rivers was giving himself up on the play and stepping out of bounds, Irvin came in to give Rivers an extra small shove, drawing a personal foul late hit penalty. The Chargers would have likely lined up on 4th down to kick a field goal giving them a 23-14 lead with plenty of time for the game to be salvaged. Instead, the flag on Irvin gave San Diego a first down in the redzone and two plays later Rivers connected with Gates to make it a 27-14 ballgame. The touchdown also resulted in a momentum swing to the home team for the remainder of the game, as the Chargers were successful in holding onto the lead for good. The penalty was completely unnecessary and in my opinion it is one of the dumbest plays Irvin has made in his career. Ultimately I believe that penalty is in essence handing the victory to San Diego on a silver platter. Thoughts on San Diego: I underestimated the San Diego Chargers, plain and simple. I understand that it was their home opener, there was record setting heat down on the field, and that the home crowd was amped up but it all comes down to this point: If the Chargers can pick apart the best defense and best secondary in the league, they can pick apart any defense. Before the season started I did not think the Chargers were capable of making another playoff run but after Sunday, it is very possible to think that barring injuries San Diego can challenge for a wild-card spot for a second consecutive season. Random Thoughts: The Seahawks matched their navy jerseys with grey pants this week. The last time they wore that combo was last season in Carolina. 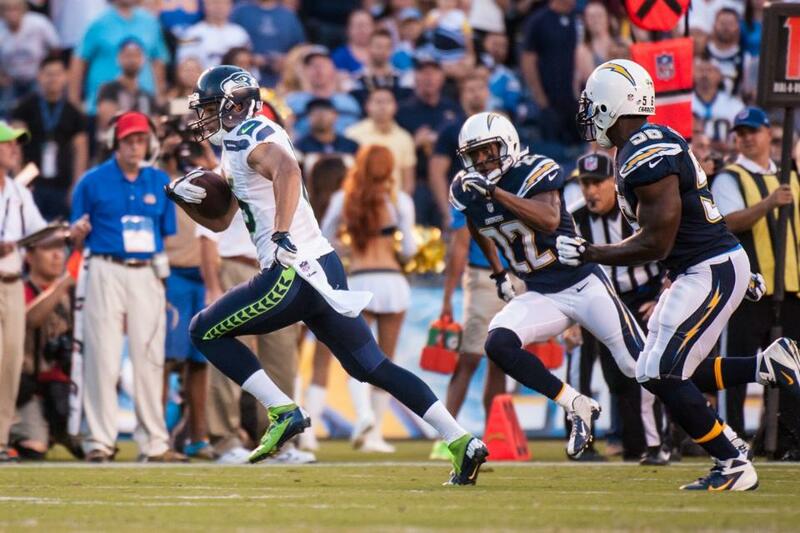 The Seahawks are now 2-2 in that uniform combo all-time… The all-white look of the Chargers is pretty cool. Although I love the fact that the Seahawks are the only NFL team to have never worn white at home, the idea of a white-out early on in the season is a cool possibility the Seahawks might want to consider for future seasons… I remember 4 years ago I went to see the Seahawks play the Broncos in Denver and the game time temperature inside the stadium flirted with the 100 degree mark. It was miserable. I am sorry for all the dehydrated, sunburnt, upset Seahawks fans who went on the road, sat in the heat for over three hours, and saw us lose. It is a miserable feeling… I want to give a lot of credit to the Chargers home crowd. They were clearly the louder voice this week after it was presumed that the 12th Man was going to have another very strong following to San Diego this week. To Chargers fans: Bring the kind of intensity you showed this week to Qualcomm for every home game. Match that intensity with the great play of the Chargers offense and you will be hard to beat at home throughout the season… Here are a couple of points to the “glass half full” Hawks fans out there. The last time the Seahawks gave up 30 or more points in a game, we went on to win our next 7 games. Also, of the last 10 seasons we have started 1-1, we have made the playoffs 7 times, won 4 division championships, went to 2 conference championship games, and made it to one Super Bowl (XL)… It helps that the 49ers also lost this week but immediately following our loss I was surprisingly not too upset. I think it has something to do with the fact that even though we lost, the Seahawks still have a Lombardi Trophy. That’s a feeling that perhaps comes given that the city of Seattle had been starving for a sports championship for so long and now that we finally have a Super Bowl win, it makes the sting of these regular season losses more bearable. Am I the only one out there that feels that way? It is an interesting yet prideful feeling in my opinion. The Seahawks now get back to work as they prepare for the AFC West leading Denver Broncos in a rematch of Super Bowl XLVIII. Check back Saturday for my Broncos preview. Have a good week 12th Man. Go Hawks! It’s time to hit the road for the first time in 2014. After demolishing the Green Bay Packers in week 1, the Seahawks now hit the road to take on the San Diego Chargers. The Seahawks are 1-0 and are coming off a long break following their 36-16 win over a week ago. The Chargers however are in the opposite boat, losing last week to the Arizona Cardinals 18-17 and this will be a short week for San Diego as they played on Monday night. The Seahawks lead the all-time series with San Diego 26-23. Their last meeting came in 2010 when Seattle edged the Chargers 27-20 at CenturyLink Field thanks in large part to two Leon Washington kickoff return touchdowns and two Earl Thomas interceptions. Since this is an early season road game it will be very important for the Seahawks to come out strong and show that they are the better team early on in the game. This is what I will be looking for in this week’s game. Under Russell Wilson the Seahawks have a 1-1 record in opponent home openers. In these two games the Seahawks have averaged only 14 points per game. On offense this week I believe it is imperative for the Seahawks to put early points on the board in order to silence the crowd. As always this begins with being able to run effectively with Marshawn Lynch but also keep an eye out for Percy Harvin and Russell Wilson to have a bigger impact in the running game. I believe that if the Seahawks use Wilson on the ground more this week we will be able to move the ball in huge chunks. San Diego gave up 109 rushing yards last week and 29 of them came from Arizona quarterback Carson Palmer, one of the most immobile quarterbacks in the league. Read option and designed quarterback runs this week I think could give the Seahawks a great chance of exchanging potential field goals for touchdowns. The adjective that best sums up the play of the San Diego Chargers offense last week: terrible. Against a solid Arizona defense the Chargers were only able to score 17 points, only 3 of which coming in the first half. There has been a lot of talk about Richard Sherman not seeing any action last week but Chargers quarterback Philip Rivers has come out and said he will likely test Sherman this week. After looking at the film of the Chargers game last week however, I think if the Seahawks pass rush can put constant pressure on Rivers this game will be over fast. On the Chargers final drive last week with the Cardinals sending 4, 5, and even 6 guys on blitzes, Rivers tried to make quick short throws that were either batted down at the line of scrimmage or were just flat out terrible throws. My defensive focus this week is on Bruce Irvin, O’Brien Schofield, and K.J. Wright. These three linebackers will rush the passer from the second level of the defense along with Cliff Avril and Michael Bennett along the defensive line. Given that the Chargers offense is most effective passing the ball, adding additional pressure on non-passing downs could give the Seahawks many opportunities to force bad decisions by Rivers, hopefully resulting in turnovers. As dangerous as the San Diego Chargers offense can be, I am interested to see how their young and talented defense plays with the home crowd behind their backs against the best offense they will likely face this season. The Chargers defense recorded 58 tackles, 4 passes defensed, and 2 sacks last week and this week they face a challenge in game planning as they will have their hands full with Russell Wilson, especially right after playing a pocket passer such as Carson Palmer. I believe the best way to attempt to bully the Seahawks offense is to get to take advantage of matchups along the offensive line. Offensive tackle Justin Britt is the man on the Seahawks offensive line I am most concerned about in this respect. The man who will likely line up across from Britt this week is my X-Factor player to watch, defensive end Kendall Reyes. Reyes had a quiet night last week, recording one tackle. Even though Reyes’ stat line was not impressive, it must be noted that his 5 sacks in 2013 was second among all San Diego defenders, making him a concern for Seahawks offensive coordinator Darrell Bevell to deal with. In order to overwhelm Britt, I would not be surprised if Chargers defensive coordinator John Pagano uses Reyes and right side linebackers Jarrett Johnson and Manti Te’o in blitz packages to dial up extra pressure to try to collapse the right side of the pocket. This would force Russell Wilson to make throws against his body. Random Thoughts: This week is “White Hot Sunday” in San Diego. The Chargers wear white for their first home game of the season while encouraging all fans in attendance to wear white as well. The Chargers will wear white jerseys and white pants, forcing the Seahawks to wear their navy jerseys this week. Expect the Seahawks to wear either white or grey pants this week. If I were a betting man, I would say the Seahawks will wear grey pants. If you are lucky enough to be on the road and attending this week’s game remember to WEAR NAVY… I have the feeling that there will be a strong contingent of Seahawks fans in San Diego this week. It is an easy trip to make and the Chargers have had a history of difficulty selling out their home games. Could we see more Seahawks navy than Chargers white in the stands this week? I think it is more of a possibility than you might think… Thom Brennaman and David Diehl have the call for FOX this week… Pete Morelli is this week’s referee. Coincidentally, Morelli also officiated the Seahawks matchup with the Chargers in the preseason last month… This week is a 1:05pm start not a 1:25pm start. Not that it matters too much since it is a road game but this will be the first of only two 1:05pm kickoffs this season. The rest of our afternoon starts will be 1:25pm… RedZone in the morning and the Seahawks in the afternoon this week. I enjoyed watching 8 hours of only RedZone last week not having to worry about the Seahawks… Qualcomm Stadium is a dump. Plain and simple. Other than the O.co Coliseum in Oakland, Qualcomm Stadium is the worst active NFL Stadium. Even though I went there to see the Mariners play two baseball games there in 2003, the difference in stadium experience between seeing a baseball game and seeing a football game is probably microscopic. Jim Trotter of Sports Illustrated and theMMQB.com even called Qualcomm “an insult to dumps everywhere” in a well-written 2013 piece outlining the troubles with the stadium and the battle between the Chargers and the city of San Diego to build a new stadium. It is a good read that I definitely recommend… If the Seahawks beat the Chargers it will be the second consecutive season that the Seahawks start 2-0. Prediction: The Seahawks and Chargers will both get off to a slow start offensively but the Seahawks will settle down in the second quarter. Marshawn Lynch will run for a touchdown and Steven Hauschka will kick his 3rd field goal right before halftime. The Seahawks will take a 16-7 lead into the second half and while Philip Rivers will lead the Chargers back to within one score, Russell Wilson will throw for a pair of touchdowns to put the game out of reach for good. The Seahawks will go to 2-0 with a big game against the Denver Broncos at home on-deck next week. Check back Sunday night for my review of this game. Enjoy the game people and go Hawks! Welcome to another season of Seahawks football on the blog! The Seahawks kick off the preseason tomorrow night in San Diego as they take on the San Diego Chargers. The Chargers finished 2nd in the AFC West in 2012, posting a 7-9 record. Unfortunately this mark was not good enough to save some jobs and the winds of change hit San Diego. Norv Turner was fired as head coach and former Denver offensive coordinator Mike McCoy was named head coach. Ken Whisenhunt, the former Arizona head coach is now the Chargers offensive coordinator. The Seahawks finished 11-5 last season and lost to the Atlanta Falcons in the NFC Divisional Playoffs. 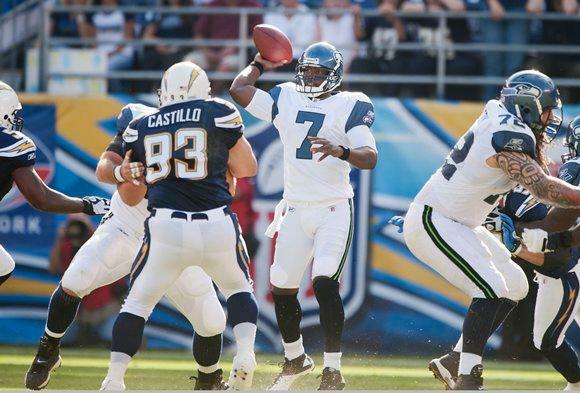 The Seahawks and Chargers last met in the preseason in 2011 when the Seahawks defeated San Diego 24-17. Even though it is the preseason here are a few things I will still have my eye on. Russell Wilson will only see a series or two to start the game. I think we will quite a bit of Tarvaris Jackson and even more of Brady Quinn tomorrow night. Jackson was listed as the number two quarterback on the newly-released depth chart last week. The coaching staff knows what they have in Jackson and it wouldn’t surprise me to see Jackson play through the first half and Quinn play the entire second half. Winning is secondary in the preseason but if the Seahawks cannot score early in the game with the first and second string units, the Seahawks will struggle to win. Based on what I have seen during training camp, Quinn has consistently struggled to move the ball during 11-on-11 drills and is very timid to make vertical throws, often choosing to check down to the running back or slot receiver. If Quinn can lead the Seahawks on a couple scoring drives he will have a much greater chance in my eyes to win the backup quarterback job. With Percy Harvin out and Sidney Rice questionable after his knee procedure in Switzerland, many of the Seahawks young receivers will get a chance to show what they can do on Thursday night. I will be focusing on three receivers tomorrow night; Jermaine Kearse, Chris Harper, and Stephen Williams. Kearse is projected to earn a roster spot behind Sidney Rice, Golden Tate, and Doug Baldwin since Percy Harvin will start the season on the Physically Unable to Perform list. The coaching staff likes Kearse a lot and he is seen as a sleeper who can stretch the field. Chris Harper is our 4th round rookie who in my opinion has not impressed much during training camp. With the play of our other receivers fighting to make the roster, Harper could wind up being a casualty when it comes time for roster cuts. Harper will need to play well during the preseason to prove he belongs on the team when we open the season against Carolina. Stephen Williams is arguably having the best camp of any wide receiver. All three quarterbacks have developed chemistry with Williams and he could also be a vertical threat. I expect to see a lot of Stephen Williams on Thursday night. On defense for the Seahawks, I am focusing on three spots. Defensive end, defensive tackle, and outside linebacker are the positions with the most question marks on defense. Tony McDaniel will get the start at defensive tackle alongside Brandon Mebane on Thursday night. McDaniel will most likely compete with Jesse Williams and Clinton McDonald for the starting defensive tackle spot. Malcolm Smith will start at outside linebacker with Bruce Irvin taking his spot on passing downs. Smith is the favorite to win this job, replacing Leroy Hill who spent 8 seasons starting at outside linebacker. Cliff Avril is nursing a foot injury and will not play Thursday night. Mike Morgan and Michael Bennett will see time at defensive end with Red Bryant on the other side. For the San Diego Chargers, they spent the offseason trying to fix their once-dominant offense. Mike McCoy was hired as head coach, coming over from Denver where he coached one of the most explosive offenses in 2012. The Chargers used their first round draft pick on offensive tackle D.J. Fluker, which goes to show how poor the Chargers offensive line has been over the past few years and, in effect, how bad the offense has struggled as a whole. With a stronger offensive line, running back Ryan Mathews looks to bounce back after another disappointing 2012 campaign and Philip Rivers also looks to bounce back after two sub-par seasons. I am curious to see how backup running back Danny Woodhead fits into the Chargers plans. I expect to see a lot of Woodhead on Thursday night. On defense, San Diego filled a hole at outside linebacker by signing free agent Dwight Freeney. Freeney adds veteran leadership to a position group that is more-or-less inexperienced and also adds a punch rushing the passer. One of the most notable additions for the Chargers this offseason was the drafting of linebacker Manti Te’o. Te’o and Donald Butler will both start at inside linebacker and it will be interesting to see how Te’o moves around the field, given one of his weaknesses before the draft was his tackling. Random Thoughts: First and foremost, it feels so good to be back… The Seahawks will have 9 days off before coming home to play Denver. They will then have only 6 days off before playing Green Bay and another 6-day short week before ending the preseason against Oakland… The weather forecast for Thursday night is high 60’s and partly cloudy at kickoff. We have played in the sun every time we have gone to San Diego to play in the preseason… I have been to Qualcomm Stadium to see the Mariners play the San Diego Padres 10 years ago. How that stadium ever hosted a super bowl I’ll never understand. It is a dump (but not as bad of a dump as Candlestick)… The Seahawks will wear white uniforms Thursday night. No word on pant color yet… Curt Menefee and Brock Huard have the call on Q13 FOX this week. They will call 2 more Seahawks preseason games… I do not care if we win this game. All I hope is that we can leave San Diego injury free. Prediction: I think the Seahawks will look a bit rusty at the beginning of the game but we will put together a couple lengthy drives that will result in points. I expect to see Brady Quinn struggle but improve as the game goes on. Unfortunately however I think that the continuity Chargers backup quarterbacks Charlie Whitehurst and Brad Sorensen is stronger than the continuity Quinn has and that will be the difference in the game. Check back on Friday for a review of the Seahawks first preseason game of the season! Go Seahawks!